You’ would need a permit to use a nonmotorized boat like this on Oregon waters. Things might be changing at the federal level now, but in Oregon the regulators never sleep. Nor the taxers. Now they have their eyes on people rowing boats on our lakes and paddling or floating down our rivers. The Bulletin newspaper in Bend called my attention to House Bill 2320, introduced in the 2017 legislature at the request of Gov. Kate Brown for the State Marine Board. The bill would do a couple of things. It would require people to wear life jackets when floating on inner tubes or air mattresses or any other “nonmotorized craft.” And for the use of “nonmotorized boats” such as canoes, where life jackets already must be on hand, the bill would establish a permit requirement accompanied by fees. 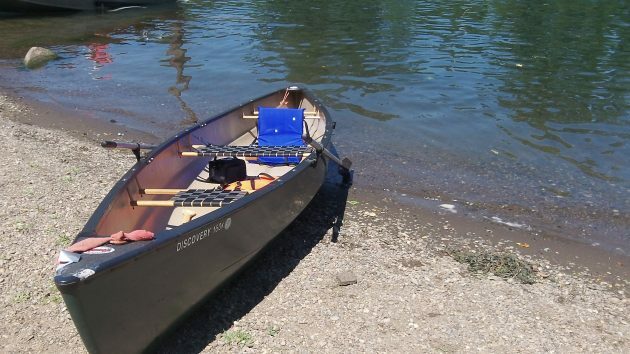 If you want to mess about on the water in a canoe or kayak, a one-week permit would cost $4. A yearly one would be $12, and for $20 the permit would be good for two years. Boaters would have to carry the permits while on the water and produce them when a peace officer asks. The fee amounts are small. (The bill doesn’t say, but presumably the nonmotorized fee would be in addition to the seven dollars or so already charged for the required annual permit to guard against invasive species.) And it’s not unreasonable for the state to seek more user revenue to help offset the cost of providing riverside facilities such as launch ramps and restrooms. 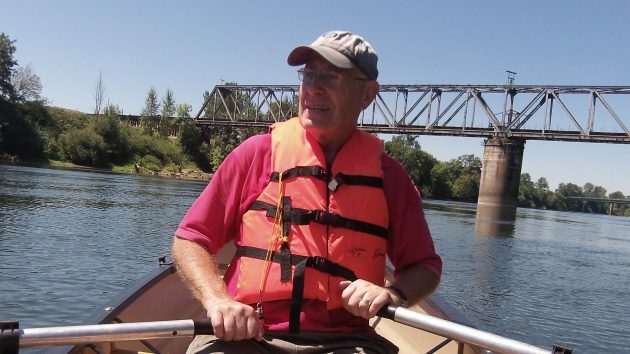 That’s me on the river a couple of summers ago, nonmotorized and permit-free. This is a very bad proposal. While I disagree with the fee, that is not the main issue. Folks who float with inner tubes down our local Santiam or Willamette Rivers are frequently also engaged in swimming as well. That is, part of the day is spent on the tube, part actually swimming. One can not swim with a life vest, so this law basically makes it a crime to swim in the river if one also has an inner tube at hand. Very, very bad idea. Far too much government over-reach into the recreational life of citizens with this idea. Let your voices be heard, contact your representatives. The following is the link to the House Bill from the Oregon state government web site. 1) Declared emergency — effective on passage. This is an example of the abuse of ‘Emergency’ declarations on new laws, Surely this is not what most folks think of when they think of emergency. To be very clear hear, and considering our Bryant park where the Calapooia meets the Willamette, where many, many folks gather during hot summer days. This law would make it illegal to enter that water with an inner tube or floating device unless one also has on a life vest. Ironically, it would be totally legal to enter the water without an inner tube to swim, but if one took a tube with them, they would be breaking a law and subject to punishment. This is criminalizing what has been and should be normal and customary behavior in our society. It should be up to the individual to assess the risk of entering the waters at Bryant park without a life vest. This should decision should not be mandated by a government entity. Now, I need to find my representatives to email. The thing to know is what was the conversation that led up to this? Typically it is another way to harrass would be fun seekers for fines. I already pay $7 for invasive species protection on my canoe, my drift boat and $77 for my 16′ fishing boat. I pay almost $100 for a fishing license that includes enough access that I should not inadvertently catch a fish, crab or mollusk that I do not have a permit for. Then I have to read the ODFW book an determine what I can catch in the spot that I am fishing. Total steelhead catch last year 1, crabs 12, trout 2. Might be time to give it up. Oh, and if salmon are so scarce why is gill netting still allowd? It would probably cost as much to administer as any revenues. How many MORE needless state employees would be hired for this? It’s just another scam to hire more “contributors” to their union for political purposes. While I share your longing for the good old days, when each of us was an island responsible only to ourselves and only for ourselves. That era has passed. In this new transactional era everything is negotiable. You might wish not to don a life jacket whilst tubing Periwinkle Creek. Under the new Trumpian-regime, prior to your being allowed to tube sans safety, you will be forced to sign a waiver fully indemnifying any passing-by ODFW, BLM or US Forest Service agent should they choose not to assist you in your time of trouble if your tube is not displaying the proper licensure. I know it sounds cruel, Hasso. We’re in new territory. Maybe they’ll use the fees to pay for bike lanes. They have a rather large budget gap that needs to be filled because “we” voted NO to making corporations pay a little more. Perhaps I should have put that in ALL CAPS! WHY DON’T THE DEMS DO SOMETHONG ABOUT THE $22 BILLION UNFUNDED PERS DISASTER THEY CREATED RATHER THAN CONTINUE TO FUND IT AND ALWAYS WANT MORE TAXES TO PAY FOR IT. ALLCAPS SATISFY YOU HJ.ANONY1. Al, like the shouting! *wink* Well stated. PERS is a problem. Elephant in the Oregon room. I’m first in to negotiate that if FASCISM if off the table. I have floated the Santiam from Green’s bridge to Jefferson and it is appalling the amount of trash bottles float devices and and anything else you can lose while you’re floating down the river. My friend and I filled his boat full. Yeah we stop and pick things up or nobody else will, but that’s why we do it because nobody else will. That one stretch of river has 90% of the calls to the Sheriff’s Department for Rescue. They ended up putting a lock on the gate and you have to go to OFW and get a key from them to use that boat access area. Maybe now with our new technology in cool phones we can get a video of some of those people when they leave and then give them tickets when they get out of the water because they don’t have half the stuff they took with them. Sorry, I didn’t mean to rant and rave so much, but if you’ve ever been down that beautiful river to see all that trash, it’s very disheartening. That raises a huge question about how this constitutes an emergency. In my humble opinion, regulating away additional choice while declaring a state of emergency in the bill to make it effective immediately does not demonstrate good judgment on the use of an emergency declaration or appropriate discretion for public input and debate on an abridgment of an individuals choice. Let your voice be heard on this bill. Thanks for attempting to correct my link. However, when I clicked on yours, it also does not work. The Oregon government web site appears to make it very difficult to cut-n-paste web locations. The ‘Downloads’ link that it presents when clicking on a measure seems to be temporary, or just for the original user or something. Try the following, but then one must 1) click on House Bills, then 2) click on HB2300-2399, then 3) click on 2320 to finally get to this bill. Also, I could not agree more on this abuse of the emergency clause. Well, that link does not work either, even though I tested it before posting here. Perhaps now link that starts with ‘olis’ will work. I guess, start here, and then wander your way down through the 2017regular session bills till found.